Today marks my 10th week of pregnancy. Since I didn't update the previous weeks I'll quickly fill you in. Weeks 1 through 8 is the embryonic stage where the baby forms all of it's vital organs. That time is a "pretty big deal" as far as the baby's development. I didn't find out I was pregnant until I was 4 weeks along and really had no symptoms, like I said before it seems like I just knew I was pregnant. Luckily, I haven't been sick or feeling anything but feeling very tired at times. There've been a few episodes of nausea when I see certain foods, namely chicken and shrimp, but little baby was developing everyday inside me and I loved reading each week what it was "working on" and growing that week. "Although he's barely the size of a kumquat - a little over an inch or so long, crown to bottom - and wieghs less than a quarter of an ounce, your baby now has completed the most critical portion of his development. This is the beginning of the fetal period, a time when tissues and organs in his body rapidly grow and mature. If you could take a peek inside your womb, you'd spot minute details, like tiny nails forming on fingers and toes (no more webbing) and peach-fuzz hair beginning to grow on the skin." We've been to three doctor's appointments which I love and look forward to so much! Our next appointment won't be until 13 weeks. We won't do a sonogram at that appointment but we'll get to hear the little baby's heartbeat! I can't wait!! Hopefully I'll keep up this "week by week" thing and share with you news and feelings and updates from our doctor's appointments on those weeks that we have one. I am so happy and even though I'm not very far along I absolutely LOVE being pregnant. But, also I already want it to be over with so I can meet our baby and find out what we are having. We are going to "be surprised" at delivery to found out whether we are having a boy or girl. Even though our baby is a precious angel, that's not a halo above it's head. 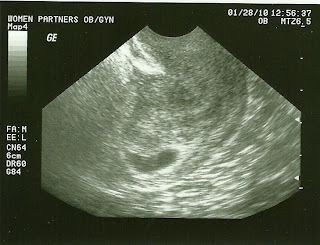 :) It's the yolk sac that should soon be gone. At the 9 week appointment I was amazed to see how much easier it was to see the baby. Baby K has grown so much! Blake got to see the heartbeat, the dcotor showed us the umbillical cord and said it looked great. 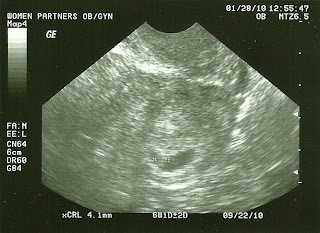 This appointment we paused the sonogram a lot because Baby was moving around like crazy! Dr. Vanover said baby k was putting on a show for mom and dad and boy was the baby "performing!" Flipping and wiggling and dancing around. Baby must like plain cherrios and banana slices for breakfast! I can't wait until our next appointment! I love hearing about our babies growth. 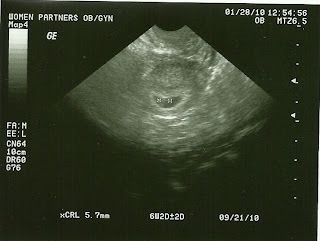 The next appointment we won't get any pictures but we will just get to hear the heartbeat. I can't wait!! I wanted to tell our parents in a special way and thought of all different kinds of ideas but I thought this one was the most fun. We each called our parents to ask them to go to dinner with us that night. We hadn't seen either set of them in a while so it was perfect timing for a get-together dinner...they wouldn't "be on to us." :) Before we left for dinner we stopped by their houses to tell them the good news. We went by Blake's mom's house first. I was so nervous and couldn't stop smiling and just knew the second she saw us she'd know. But, luckily I was able to keep composure for a few minutes. I casually gave her the envelope and said, "we are having a little get-together, ntohing big, which is why I didn't want to mail the invites." I know...kind of dumb, but how else was I going to explain handing her a random invite. No one's birthday was coming up so i just "winged it." :) Kathy read the invite, looked at us and said, "What??? is this true" with a huge smile on her face and then gave Blake and me a hug. We told her about our doctor's appointment that morning and then said that was the real reason behind dinner plans but we had our parents still to tell. We left her house and headed to my parents. My mom was winding down from her work day and my dad, Blake and I were talking in the kitchen. i was so anxious to tell them and wanted my mom to come in with us but she's a busy abee and never still. After she was in the kitchen I handed her the envelope and told her the same generic story about a little causual get-togther. my mom and ad werw stanidng on opposite sides of the island but I knew my dad would quickly now because my mom started tearing up and kept repeating, "Really? really? really?" over and over . i told her to show dad so he could join us too but I finally had to grab it from her hands and give it to him to read. They were both ecstaic and cryed and gave us big hugs. It was a great, fun day and we enjoyed dinner with both sets of parents talking about baby and all we have to look forward to! 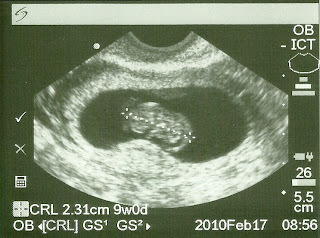 On January 11, 2010 we found out little family of two would in 9 months become 3. Shock and awe hit quickly, at least for me, Blake was as cool as a cucumber...I know, crazy right?! :) It took a day or two for my nervouseness and the realization that I was going to be a MOM turned into overwhelming excitement and the realization that I was going to be a MOM!! Yay! We weren't trying and actually had everything "perfectly planned" and wanted to start our little family sometime in 2012...so, we just got a really early start that's all!! I am not really sure why I decided to take a pregnancy test that morning. I just felt something was different. It wasn't sickness or that I felt physically different in anyway, I guess I just knew. I have taken a pregnancy test before but the only difference from the past couple of times and this time was that before I even set the stick on the counter I saw two lines. "Oh my gosh, oh my gosh, oh my gosh, oh my gosh, oh my gosh..." was all I could say. I quickly scurried to our bedroom where Blake was still asleep. (I'm giggling right now because I can see me looking just like my mom...when she's in a hurry she scurries. Haha! So cute.) "Blake, I think you should see this. Get up!" Blake rolled over and looked at me, probably thinking, "What does she have to tell me to do??" Haha. But, I gave him the pregnancy test, he looked at it, asked why I was freaking out and then rolled back over. I jumped on the bed, waiting a little bit more of a reaction from him and asked, "You aren't scared?? You aren't freaking out??" He rolled over again to face me and said in his calm tone (He is 99.9% always calm...something I find so curious and hard to understand. I know, crazy right?! ), "No, I think it's great." His reaction made me feel a little bit more at ease as it always does. 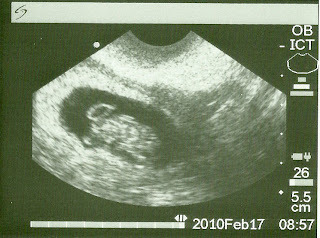 So, that's how we found out the exciting news and each day that passes the less and less anxious I feel and the more and more I fall in love with this little bundle! I have been feeling great besides a few incidents where a certain food (chicken mostly for now) made me sick. I am so far enjoying pregnancy and just can't wait to see what the baby looks like! !